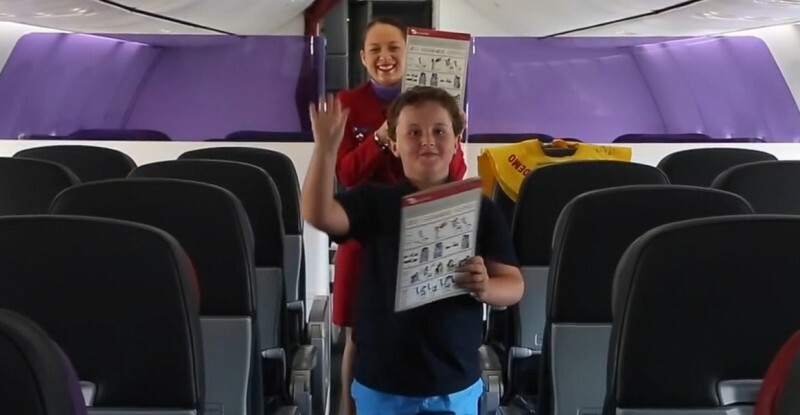 Lucas has a fascination with on-board airline safety demonstrations, and particularly that of Virgin Australia . So much so, that seven year old Lucas made himself a makeshift oxygen mask, seatbelt and life vest so he could perfect the demonstration at home (and perfect it he did!). When Lucas Stibbard’s mother called Virgin to book their Bali holiday, she asked if it were possible to source Lucas a personalised Virgin name badge. The carrier went one step further and gave him a flight he’ll never forget. Lucas suffers from Asperger Syndrome . It’s not necessarily a debilitating condition by any means, but it does affect his early developmental social behaviour. To have attention provided in a carefully orchestrated manner, it can open up areas of Lucas’ personality that lie dormant behind a certain awkwardness. At checkin, Lucas and his sibling s were given a gift – a model 737-800 – the same model that Lucas uses in his home-grown safety demos. Once Lucas was on board the aircraft, Lucas was given a pilot’s hat, a name badge, and a cabin crew (demonstration) safety kit. He was then given the opportunity to participate in a cabin safety demonstration before passengers boarded. Watch the video below (viewed 74,851 times on Virgin Australia’s TY channel).